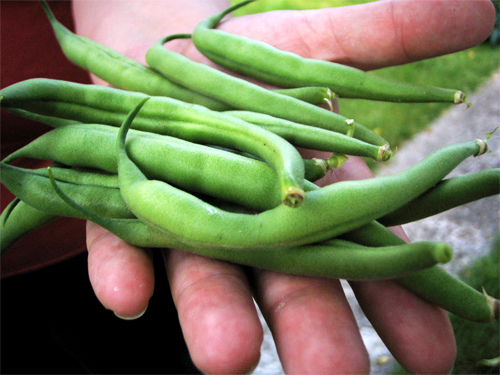 It’s that time of year again: the time when our garden’s green beans are in full swing. Those of you who grow (or have grown) green beans know that once they start producing, you are going to be swimming in beans for a little while. Tara and I are enjoying our second harvest season here at the church parsonage, and believe me, we love green beans. We love them so much that we planted twice as many as we did last year! “Swimming” in beans might not be the right term for what we are experiencing right now. It’s more like a green bean flood. The amazing thing about picking green beans is that it seems there are always more to pick. Just when you think you have moved every leaf and branch, another few beans catch your eye as they dangle secretly behind another hidden branch. You can pick all the beans you can see, but if you move a foot away – or look at the plant from the opposite side – you will see many more beans to pick. And of course if you manage to find all the full-grown beans in one picking, just come back in another day or two and you’ll have that many more to harvest. In much the same way, there is something to be said for continual Bible study. If we read a portion of scripture once, we cannot hope to have gleaned all of its meaning. It takes continual effort, time, and different life perspectives for us to benefit fully from the Word of God speaking into our lives. In fact, while I work on each week’s sermon, I read and re-read the sermon text several times – many times out loud – so I have many opportunities to see the passage from many different angles. Just like a cluster of green bean plants, there is always something more to find. By the way, whatever you love you will spend a great deal of time studying, thinking about, remembering, practicing, and working toward. We find it easy to do these things for people whom we love. I find it easy to pick green beans, because I love the harvest. What is your attitude toward the Word of God?